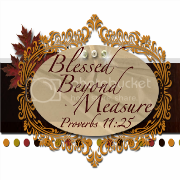 Have you met Torrie from Blessed Beyond Measure? She is one of my absolute favorite "bloggers". 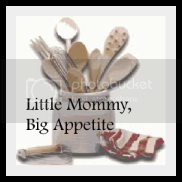 She is a married, stay-at-home mommy with a very inspiring and relatable blog. She started posting last year when she felt led by God to share His message through her life experiences. I was sitting around on "Oscar Day" wondering what the real hype is about celebrities and the red carpet... and then Torrie posted this: "Hooray for Hollywood"...you have to read it for yourself, but I felt so blessed with my life as a mommy after reading. It's a must read. I'd love for you to check out her site. She has giveaways, and weekly postings that I will link up to share with you. Also, she asked me to be her new food contributor... how fortunate am I? I feel so blessed to be a part of Torrie's amazing blog. Drop by and tell her hello, and then stick around to be inspired! I'm speechless (which for a blogger is pretty difficult)! Thank you so much for you post. It's an honor & a joy to be apart of such an amazing blog community. I look forward to all that God has in store as we partner together. He is so good...I truly am Blessed Beyond Measure! !